Petal Perks Rewards Information | Connells Maple Lee flowers and gifts - Flowers, Plants and Gifts with same day delivery for all occasions. Petal Perks is an exciting rewards program for earning a discount off a future purchase by simply shopping at Connells Maple Lee flowers and gifts! The more you shop, the more you can save! 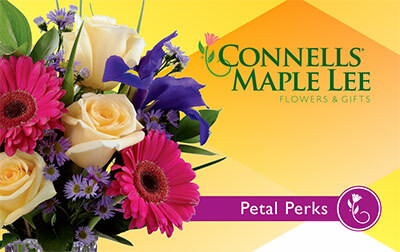 If you have a Connells Maple Lee flowers and gifts house charge account, you are already automatically enrolled in Petal Perks. Your charge account number is your Petal Perks account. Yes! Visit cmlflowers.com and click on "My Account." Under the "Petal Perks" subheading, click "Overview and History" to view your current accumulated points, transactions and promotional points earned. No. Accounts that have pre-existing discount arrangements with Connells Maple Lee flowers and gifts are not eligible. Guest Checkouts on cmlflowers.com cannot earn or redeem points.